AOL has unveiled a prototype of its revived Netscape Browser, which serves as a test bed for several new features. The new Netscape is based on Firefox, but with a twist - it includes support for switching to Microsoft's IE engine. BetaNews has also learned that Netscape's development was not done in-house by AOL, but rather outsourced to Canadian software firm Mercurial Communications. 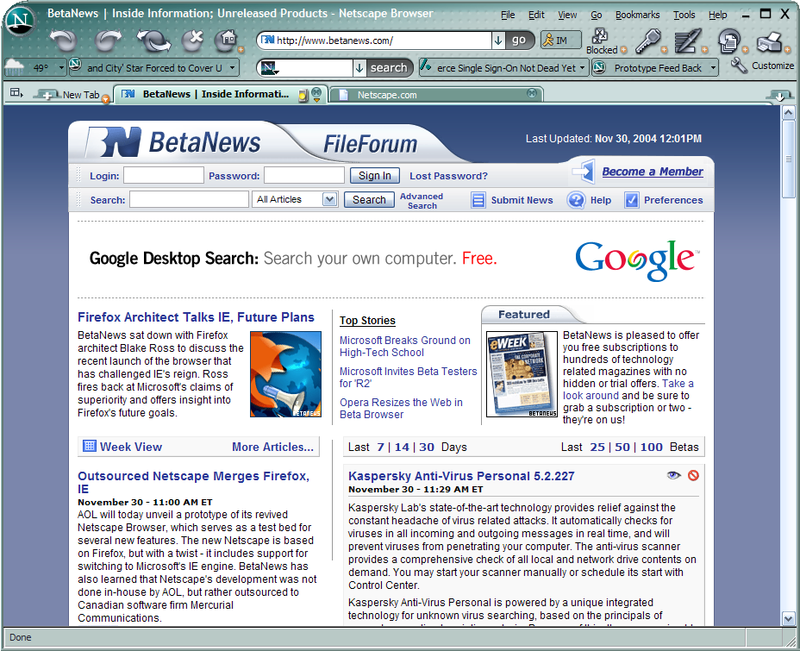 The Netscape prototype is built upon Mozilla Firefox 0.9.3, which means it utilizes the same user interface toolkit and Gecko browser engine. The browser's theme has been redone to match Netscape's traditional green style and, as expected, customized Netscape-specific extensions have been added to the toolbar offering weather and news headlines. Surprisingly, Netscape now includes the ability to swap rendering engines, using Internet Explorer in lieu of Mozilla's Gecko. AOL tested similar browser agnostic functionality dubbed Komodo in 2001, but eventually dropped plans to integrate the technology into its AOL client, which solely uses IE. Like Maxthon and Avant Browser, Netscape loads Microsoft's IE ActiveX control within the browser interface to perform IE rendering. A source close to the company said AOL opted to include IE engine support in order to offer users more choice, as some sites are optimized for certain browsers. But to avoid security vulnerabilities found in IE, Netscape "gives the user the choice through Site Controls of what sites they trust and don't trust by allowing them to turn off Web functionalities that expose security holes on a per site basis," the source told BetaNews. Security is a major focus of the Netscape prototype. AOL has expanded Firefox's tabbed browsing to include security settings that apply to a single Web page. In addition, a new "anonymous mode" clears all history and cookies upon Netscape's exit. By building such added features onto Firefox and offering Internet Explorer compatibility, AOL hopes to reinvigorate a browser whose appeal faded long ago. Netscape has received little attention since the release of 7.0 in August 2002, and its market share has dropped to single digits. To bring Netscape back to life, AOL tapped Mercurial instead of attempting to rebuild a development team that now leads Mozilla-based efforts including Firefox. In a Web log posting, Firefox developer Blake Ross wrote that AOL was even offered the browser, but the company rejected it. AOL said Mercurial was an "important technology partner" on the Netscape browser, but would not offer any specifics. Coincidentally, Mercurial has also been working with Microsoft, according to a company news release. Nonetheless, the new Netscape team is excited at its prospects. With the prototype out the door, development plans include improving the user interface and expanding toolbar functionality. The underlying Firefox core will also be updated to the final 1.0 release when Netscape makes its official public debut. Eric Steil contributed to this report.